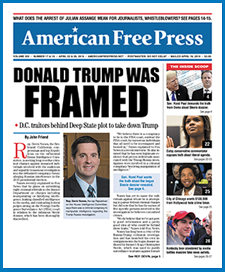 AMERICAN FREE PRESS was the first news organization to regularly cover the now infamous Bilderberg meetings, the late James P. Tucker, Jr., famed ‘Bilderberg Hound,’ author of Jim Tucker’s Bilderberg Diary, spearheading the effort. Now, Mark Anderson’s at “the scene of the crime,” as Jim was fond of saying, near Innsbruck, Austria. Mark discusses his first day in the field covering Bilderberg, which begins Thursday, June 11, and runs through Sunday, June 14. Dave Gahary spoke with Mark from his hotel room in Telfs, Austria, for this second update interview (23:59). TELFS-BUCHEN, AUSTRIA—If it’s true that Bilderberg darkens an otherwise lovely day, the “overcast” social climate caused by this bund of bankers, royalty, media moguls, corporate captains, select academics and institute fellows was finally pierced by a ray of reassuring light Wednesday. That came in the form of some respectable media coverage on the eve of the June 11-14 Bilderberg meeting. The local newspaper Tiroler Tageszeitung broke what had been a virtual European media failure, so far, to give adequate (if any) coverage to the 63rd Bilderberg Conference in 61 years. While reporting in a fairly balanced manner, the paper also noted that an ex-Austrian chancellor Franz Vranitzky, who apparently attended Bilderberg 20 times, “denies” the grouping is a conspiracy. However, AMERICAN FREE PRESS founder and consultant Willis A. Carto has long argued that the very existence of Bilderberg constitutes concrete, convincing proof that back-stage governing is largely done by, and for, the super-rich, involving people most of the public would not see as their legitimate rulers. Still, what’s unsettling here is that while European media still report on Bilderberg more than the smug, careless and often-times handcuffed United States media, European coverage—developed through painstaking years of collaborative coverage by late Bilderberg hound James P. Tucker, Jr.—seems to be declining. Time will soon tell on that point, as this year’s Bilderberg meeting wraps up. Meanwhile, as of Wednesday morning, June 10, this writer took a long ride with a commendable cabbie who donated some of his time to help AFP get the “lay of the land,” including locating the two blocked entrance routes to the immensely isolated Hotel Interalpen where Bilderberg is meeting, having met there in 1988 as well. The fact that no protestors were present near the entrance gates as of Wednesday for a conference that starts on Thursday. In the past, most showed up plenty early. The fact that Bilderberg’s organizers broke protocol and closed off the hotel to the public most or all day Tuesday instead of the traditional Wednesday at noon, narrowly preventing this writer from getting into the hotel site before the meeting began. Also, that two reliable sources informed AFP that, perhaps to offset the lack of protestors thus far, up to 1,000 protestors are expected to enter Telfs around 1 p.m. local time on Sunday, June 14. That, notably, longtime Bilderberg pillar David Rockefeller observes his 100th birthday June 12 during this year’s meeting but, officially anyway, he’s not attending. And when Bilderberg (after two pushy emails from AFP requesting 2015 information and asking for a live press conference) finally posted its 2015 “press release” and attendees’ list online, it provided a discussion list of 15 topics, the longest in recent years and perhaps one of its longest ever. Also, practicing their usual “stealth transparency,” the meeting’s organizers announced that their (often one-liner) purposely vague topics are, verbatim: USA; Iran; Middle East; Greece; Globalization; Cybersecurity; NATO; Russia; Terrorism; United Kingdom; Chemical Weapons Threats; Artificial Intelligence; and Current Economic Issues. Yet, two remaining topics are especially notable: USA Elections; and European Strategy. The first of the two stands out because longtime Brookings Institution fellow and frequent Bilderberg attendee Cheng Li is involved with a Brookings working group that, at opportune times playing more than one side of the field, provides direct advice to U.S. presidential candidates. And the second one is indeed interesting because the revealing word “strategy” shows an intent to form a consensus to pursue a policy. To strategize is to put together a plan with tactics, yet the Bilderbergers constantly claim they’re a mere chummy discussion club who like to hear themselves talk and pick up handy scoops on megatrends in technology and other fields without pesky reporters (who actually report) hanging around. “A total of around 140 participants from 22 countries have confirmed their attendance,” a newly released press release from Bilderberg itself noted—re-using the generic prose peddled ever since the shadowy clique created an “official” website about six years ago to appear more “transparent” to an often skeptical public. That website also lists who’s coming to this invitation-only meeting, though many suspect the list is incomplete. Last year, it appeared that Washington Post owner and Amazon founder Jeff Bezos was there, although he was not listed for that Denmark 2014 meeting. And this writer’s call to Graham Holdings LLC, captained by longtime [former] Washington Post publisher Donald E. Graham, confirmed Graham will not attend Bilderberg 2015 (though he’s still listed as a member of Bilderberg’s “cousin,” The Trilateral Commission). Thus, rather surprisingly, the Post—for decades a media pillar of Bilderberg through its attendance, while never reporting—seems to be pulling back from Bilderberg. The only time it clearly broke its Bilderberg news silence was during the group’s 2012 Virginia meeting, the last year Graham officially attended. And for those wondering whether the 2015 topic “USA Elections” might mean that U.S. presidential candidates might sneak off to Bilderberg (as has happened before, including Bill Clinton attending Bilderberg 1991 and becoming president a year later), the answer is not yet known. But the highly influential Council on Foreign Relations (CFR)— a major “spoke” that connects to the Bilderberg “hub”—did recently welcome candidates Hillary Clinton (D), Senators Marco Rubio (R-Fla.) and Lindsey Graham (R-S.C.) to present their presidential plans. And with CFR co-chairman Robert Rubin, a Goldman Sachs alumnus and former Clinton Treasury Secretary again attending Bilderberg, these CFR-vetted candidates are all-but-certain to be on the lips of this year’s Bilderberg attendees. Watch for more news dispatches soon for Bilderberg 2015.